I think we have two or three headers, so look up at the top of this page and you may see it..
A lawyer who represents himself has a fool for a client. Even that’s not exact, but I don’t know quite how to pin it down: something is fishy in the state of play? Is that vague enough? I think there’s an ouroboros loose in the title of Judge Kavanaugh’s op-ed, is all.. In his WSJ op-ed, Judge Kavanaugh says, “I Said a Few Things I Should Not Have Said”. Is someone who at a crucial point under oath addressing the Senate Judiciary Committee, by his own admission said things, acutely partisan, visibly furious things he should not have said, is someone to be relied upon to avoid doing the same on the Supreme bench on issues of inflamed political passions and high consequences? For the record, that’s a win-win-win strategy. Sen Whitehouse: How’s it played? Judge Kavanaugh: Three glasses, in a triangle..
Judge Kavanaugh: You ever play Quarters? Judge Kavanaugh: It’s a Quarters game. A “Devil’s Triangle” is a widely used term for an act of sexual congress between two men and a woman; but during his hearing, Brett Kavanaugh nonsensically insisted that this was some sort of drinking game. Okay, these matters are interesting not because they deal with threeness as in friend or foe games in which temporary alliances (twos) can overcome single ones while new alliances can switch losers for winners — nor as in Konrad Lorenz‘s goose pecking order example, where a > b > c > a — but simply because threeness is involved — three players, three cups &c.
That — apart from the brains themselves — is the basic tech involved. An obvious next step is to allow several people to join such a conversation, and today Stocco and his colleagues announced they have achieved this using a world-first brain-to-brain network. The network, which they call BrainNet, allows a small group to play a collaborative Tetris-like game. And here’s the pretty diagram that allows those like myself who have only the haziest of ideas where or what the occipital cortex is to nod sagely, acknowledging that we learn something new every day..
One isn’t, I’ve argued, even a number: one is one and all alone, and ever more shall be so. Two is the first number, standing as it does both for binary systems (duel and duet, competition and collaboration) and for many or all, as in the one and the many, or one and all.. But three — ah, three is the first differentiated number, neither two nor two plus two (aka two multiplied by two, two to its own power, two squared, four).. It stands in its own right: three. In the number series, it offers us our first hint that there are shades of grey possible between none and one, yes and no, day and night, black and white..
Three is the tie-breaker, the umpire, balance, justice — three is the liminal number par excellence. This is all a bit primitive thus far, but then it’s also a beginning — a window on vast possibilities. Three — watch out for it, in Hegel, in CS Peirce, in George Boole, in Clausewitz, everywhere! The first of two pieces I’ll explore here is from the New Yorke, Rules for Trump Chess by Andrew Paul. It’s a humor piece, but not without its satirical effect, as you can tell from Rule #1:. A handful of new pieces will be introduced during game play, scattered haphazardly across the board. They include: two overcooked macaroni noodles (Kushners), a shrivelled white raisin with lint on it (Sessions), and a washcloth soaked in warm Johnnie Walker (Bannon). Their permitted moves are unclear, but every news cycle, players must select one to put in their mouths until they gag. Knights still move in that ridiculous two-squares-up, one-square-over path. They think they are being very clever. Their creepy horse faces must always be turned to face the king. I don’t remember when I first heard the popular analogy comparing judges to umpires calling balls and strikes, but recently it’s been everywhere. When Brett Kavanaugh was first nominated to the Supreme Court, Tony Perkins of the Family Research Council called him “a constitutionalist — someone who will call balls and strikes.” This past week, as Kavanaugh’s confirmation hearings began, Sen. John Cornyn (R-Tex.) described him as “somebody who calls balls and strikes and doesn’t come up with his own strike zone.” Supposedly a judge is, and should be, as mechanical as an ump. It’s true that there are similarities. Umpires have always been considered authority figures, like judges. Both are subject to a lot of scrutiny, and we do what we think is right by rule and tradition. Umpiring is a special calling and a learned skill that requires extraordinary mental toughness. When you put on your uniform, you are supposed to leave all your subjective feelings in that dressing room. Personal integrity and respect for the game are at stake. Seeing the televised rectangle that allegedly represents the strike zone, you might surmise that any 3-year-old should be able to tell whether that little white sphere is in or out of that box. Replay has reinforced the feeling that it’s simple and obvious. Yet there are many intangibles when it comes to calling balls and strikes. What the umpire’s actually doing is gauging a baseball’s relative position as it travels 95 miles an hour into a three-dimensional area. You’re judging a pitch as it leaves the pitcher’s hand and goes to the catcher’s mitt in less than half a second. For example, the rule book states that a runner must avoid a fielder in the act of fielding a batted ball. If you collided with a shortstop who was bent over in the act of fielding a ground ball, you would be guilty of interference. But if the shortstop had completed the act of fielding and was attempting to tag you when the collision occurred, there would be no penalty. Among elite athletes, this all happens in milliseconds, and to the untrained eye, the plays look the same — both violent collisions with the ball on the ground. This requires an interpretation of when one act ended and another began, and whose rights are in effect. This is a judgment call. 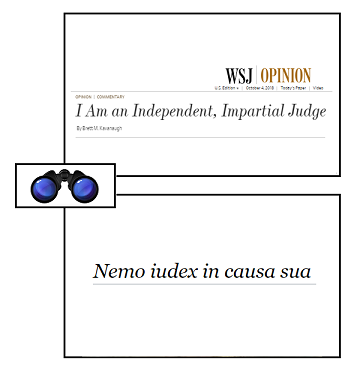 Okay, it would be neat if an appellate or superior court judge could write a similar piece on the niceties of judicial judgment..
I’ve always tended to think of umpires as the cricket equivalents of referees, and referees as the soccer equivalents of umpires, but what do I know? 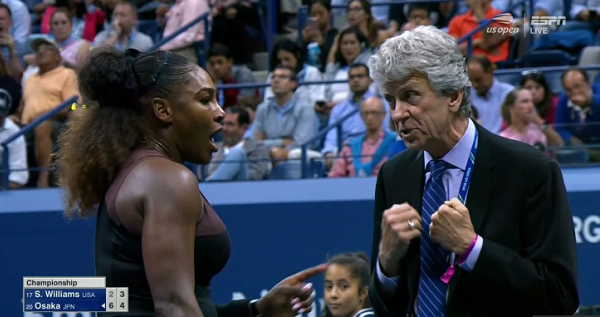 Chair Umpire Carlos Ramos arguably interfered in the match, bringing both repeated champion Serena Williams and first-time winner Naomi Osaka to tears. 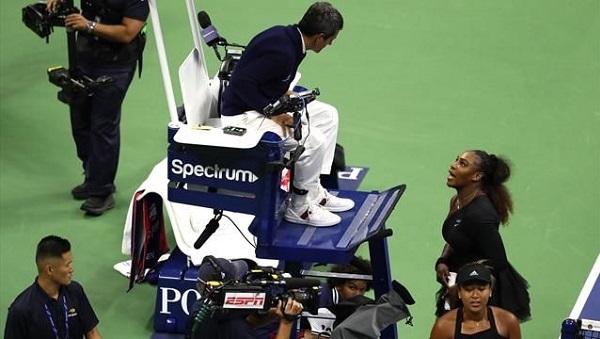 In the Serena Williams objection to penalties allotted her during the second set of her finals match with Japan’s young winner Naomi Osaka, I’ve learned today that in tennis, the umpire, usually seated in a high chair at center court makes unassailable rulings of fact, while the referee can overrule him in matters of tennis law — effectively making the umpire analogous to the jury, and the referee to the judge, in a trial by jury. And thus the analogical web widens..
A DoubleQuote-ish Strzok and Kavanaugh parallelism? I’ll try to keep this brief, and won’t use my usual DoubleQuotes graphical formalism, which would be costly in both time and space. 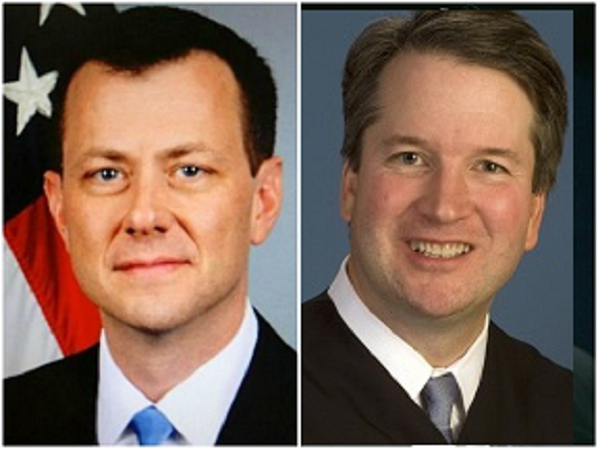 It strikes me that there’s a parallelism between the issues swirling around the nomination of Brett Kavanaugh, Judge of the Court of Appeals for the District of Columbia Circuit to the Supreme Court, and those concerning FBI agent Peter Strzok, formerly Chief of the FBI’s Counterespionage Section in the House Judiciary and Oversight Committees joint hearing today.. The parallelism can best be expressed in ternms of a question: can a professional in the field of justice holding strong political opinions credibaly claim to remain unbiased when in professional pursuit of justice? In the case of Agent Strzok, Democrats would very much prefer the answer to be Yes, while Republicans would like the answer to be an incredulous No — while presumably in the case of Judge Kavanaugh, Democrats would tend to the incredulous No side, while Republicans would prefer a resounding Yes. No doubt there are more subtleties here, but I’m no lawyer and this is the best I can manage. That quibble aside, the two situations apparently fall into different silos, and I haven’t seen anyone bringing the two situations together in the hope that one would illuminate the other. Have I simply missed the relevant materials, or does no one else wish to admit the parallelism? It seems to me that most of what I see is partisanship without much principle. Your comments, refinements and refutations are warmly encouraged. That’s from our first president, John Adams, in his letter to his wife, Abigail, but it resonates down to our day. How do we recognize wisdom? Oh? And when the last law was down, and the Devil turned round on you — where would you hide, Roper, the laws all being flat? This country’s planted thick with laws from coast to coast — man’s laws, not God’s — and if you cut them down — and you’re just the man to do it — d’you really think you could stand upright in the winds that would blow then? 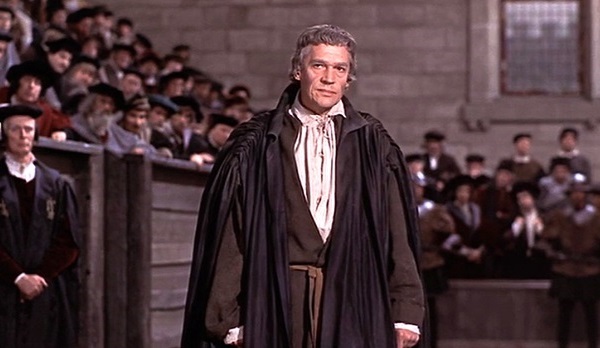 Yes, I’d give the Devil benefit of law, for my own safety’s sake. Thomas More was, no doubt a man with his own flaws, and the flaws of his times. Flaws, okay. Where is a true sense of justice? Of honor? Of integrity? Where is a man for all seasons?